1. A cube is painted on red on all six sides. Then, it is cut into 1331 equal cubes. How many cubes are colored with only one side? We know that when all the surface of the cube is colored with the same color, only one surface of the central cube is colorful. = 6 (11– 2)2 = 6 81= 486. 2. 'JIO' is written as in a fixed code language / pattern 'PIO' is written as then 'TEA' is written in the same code language / pattern. 3. Find the odd from the following given group? 25 ⇒ 2 × 5 + (2 + 5) = 17 → Q. So, 32 – J (Here is odd-one). Do the following series complete the following? 8. If 25 ÷ 5 = 35 and 26 ÷ 13 = 32 So, Similarly 17 ÷ 32 = ? = 30 – 3 = 27. I. All are mobile phones. II. Any phone is not T.V. According to the figure above. Conclusion I and II are both true. 1) A cube is painted on red on all six sides. Then, it is cut into 1331 equal cubes. How many cubes are colored with only one side? 2) ‘JIO’ is written as in a fixed code language / pattern ‘PIO’ is written as then ‘TEA’ is written in the same code language / pattern. 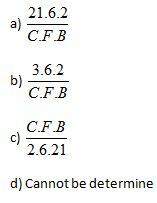 3) Find the odd from the following given group? 6) Do the following series complete the following? 7) If a mirror is placed on the MN line, given answer – which of the shapes will be a question – the correct image of the shape? 8) If 25 ÷ 5 = 35 and 26 ÷ 13 = 32 So, Similarly 17 ÷ 32 = ? = 6 (11– 2)2 = 6×81= 486.